rv-pro.com March 2019 • RV PRO • 105 rv-pro.com March 2019 • RV PRO • 105 "I feel traffic was up this year and dealers certainly were in a buying mood," he said. LCI also hosted a Power Hour event for dealers, and Boessler said LCI sales this year were up over the previous year. Bob Brammer, president of Stromberg Carlson, admits he wasn't sure what to expect heading into this year's NTP-STAG Expo given that RV retail sales show signs of slowing. "Our OEM orders slowed a little in the last quarter and so I was being realistic with my thoughts of possibly not repeating last year's numbers – a record for Stromberg Carlson. But, after leaving the show, I may term my forecast 'conservative,'" he said. "Dealers – while 'right-sizing' their lot inventory to fit the new delivery capabilities in the RV market – were very willing to look at and purchase new items and were optimistic over all." Brammer said the company's new Lend A Hand replacement grip, the Dura Grip, and its jack accessory to hold and protect a 7-way plug and safety chains were ordered in the hundreds. "The best compliment you can get is when a dealer says, 'Why didn't I think of that?'" he added. 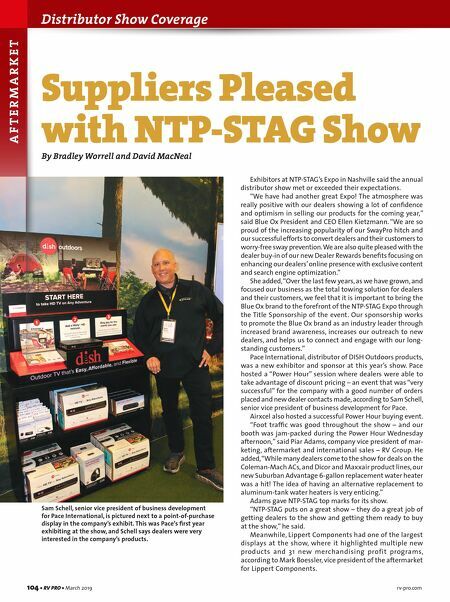 NTP-STAG was a "great show and I'm looking forward to 2019." Other suppliers also had good things to say about the NTP-STAG Expo. "PullRite had a very successful Expo in Nashville," said Scott Later, PullRite national sales manager. "PullRite participated in the NTP-STAG Power Hour for the first time this year and we are extremely pleased with the results. The amount of energy in our booth for those 60 minutes was really exciting to be part of and encouraging for the coming year." He added, "The overall attitude of the dealers we meet with was cautiously optimistic for the coming year." "Show floor and foot traffic seemed better than any other show I have attended in the past. ... I feel this was overall a very productive sales event for Carefree," said Kevin Jastrem, aftermarket sales manager at Carefree of Colorado. "We thought the show was very well-attended, and we had excellent conversations with the dealers and with the NTP-STAG sales reps," said Jordan Martindale, eCommerce marketing manager for ICON Direct. "We were very pleased with the quality of the show." Bryan Fletcher, vice president of Valterra Products, reported "great dealer traffic" at his company's booth. Based upon his interactions with attendees, Fletcher said, "dealers were very optimistic for the upcoming RV season." "Everyone seemed to have a positive outlook about the upcoming season," said David Robinson, vice president of Road- master. "It was a great show, with excellent, quality traffic." Dealers crowd the Blue Ox booth during the company's Power Hour buying event. Blue Ox was particularly pleased with the popularity of the company's SwayPro hitch.